Fallout 76 is just around the corner, having been in beta over the last couple of weeks. And while Bethesda has imposed a no modding policy in the game so far, some players have predictably already started to develop workarounds. Fallout games in general have a long history of modding, from large-scale community driven affairs, to officially sanctioned Bethesda projects. Fallout 76 looks set to continue this lineage, and it’s definitely excited to think of what the modding community will do with the new toybox of post-apocalyptic West Virginia. In this Fallout 76 Mods guide, we’ll keep you updated with all of the developments related to mods. We’ll take a look at the mods that have already been added to Fallout 76, how modders have managed to do it, and also what plans there are for Fallout 76 mods in the future. For more on Fallout 76, be sure to check out our Fallout 76 Guides Hub. It’s got a ton of info on all aspects of the game. We cover the best weapons you can find, the new Perks system, and more. 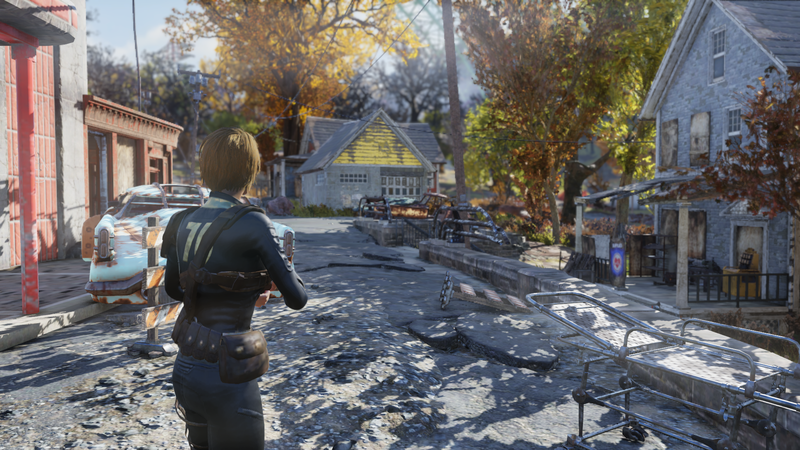 Despite only having been in beta recently, there are already Fallout 76 mods cropping up online. They’re mostly small tweaks and changes, and are likely to be taken down once the full game launches, but for now at least, they’re free to enjoy. Main Menu Music - the first, and most important Fallout 76 mod on our list is this one by CdrArchange. It replaces the menu music with Country Roads (Take Me Home) by Bob Danoff, lovely stuff. Fallout 4-Style Map - this mod by neeher changes the map in Fallout 76 to look more like a traditional Fallout map. Low-res green icons and all! Baka File Tool - if you’re a little unsure about installing mods for yourself, this tool by shad0wshayd3 makes it a lot easier for you. You won’t have to go into the game files manually, saving a lot of time and bother. Hairspray - this mod by motherofdeathclaws lets you change up the color of your character’s hair. Black Vault Suit - blue and yellow is so last season. Luckily, this mod by neeher adds a sleek black version of the classic Vault Suit. Will Official Fallout 76 Mods Be Released? Bethesda has confirmed that mod support will be coming to Fallout 76. All we know so far is that they will arrive “post launch”, so it’s really anyone’s guess as to when we see them. Really though, all this means is that players will have to wait for a Bethesda-sanctioned installer and in-game mod launcher, there will still be mods available anyway. How Are People Modding Fallout 76 Already? ‘Bethesda doesn't allow the traditional way of modding by editing some configuration files that tell the game to not require those packaged assets,’ Neeher said. Instead, you apparently have to modify the packages (called Archives) using a program within the Fallout 4 creation kit called Archive2. 'You can modify the files inside an archive with this program, such as replacing textures,' Neeher explained. It seems that Fallout 76 and Fallout 4 share a lot of the same DNA as far as programming and code are concerned. This will make it pretty simple for modders familiar with Fallout 4 modding to try their hand at Fallout 76 Mods.